Instructional Fly Fishing Videos are a great way to learn how to fly fish, and our Combo DVD Sets are a very affordable way to buy them. We discount the fly fishing videos so that the more you buy the more you save. Select the fly fishing DVDs you want to include in your personalized collection of How To fly fish DVDs. Imagine the specialized How To Fly Fish DVD collections you can create. You could package all of Kelly Galloup’s streamer fly tying or streamer fishing videos and save a bunch. The same could be done with titles on wet fly fishing or tying, spey casting and fishing, angling destinations, and so on. If you are just beginning or an advanced fly fisher you can make the instructional video collection that fits you best. 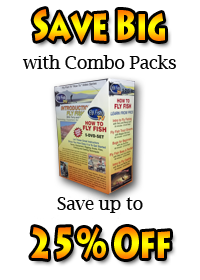 We also offer several pre-packaged bundles including our 5 disc "How to Fly Fish" beginner set (at a 40% discount!!!). This set is great for anyone getting started and it makes a great gift too!